Innovative features make scanning easy, including industry first slow mode¹ for delicate documents and double-feed detection skip to allow scanning of items such as envelopes and documents with Post-its. An intuitive colour LCD touchscreen panel makes scanning easy, and allows job creation without accessing a computer. 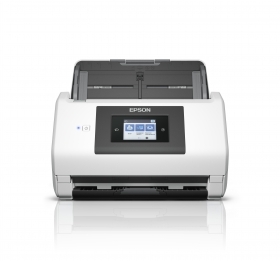 The DS-780N with built-in networking is the perfect solution for creating a scanner fleet. Epson’s Document Capture Pro 2.0² software offers complete control and security, allowing job, group, device and access protocols to be managed centrally. User authentication can be enabled via pin code, third-party IC card or user directory (LDAP), with a lockable control panel to prevent tampering. Pre-defined job profiles help ensure scans are sent to the correct locations.